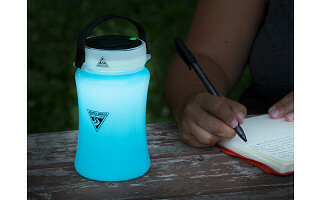 When we first heard about FireWater, we weren’t sure why one would need a combined waterproof container, solar powered light, and water bottle. But, it turns out, it’s an ingenious idea for anyone who’s outdoorsy. Charge up the solar lantern during the day or, if the sun isn’t cooperating, use the USB port. When evening hits, you’ll have 50-100 lumens to light up your tent or trek. Meanwhile, use it as a leak-proof water bottle. The LED light won’t warm up your water, but your water will have a nice colored glow. And as well as FireWater can keep your water in, it can also keep water out. This multipurpose lantern is a waterproof storage container, too. Put your valuables inside when you kayak or if it rains. As long as you keep the included elastic over the USB port, the inside will stay dry. When FireWater isn’t performing one of its many functions, it collapses down to pack. Store it in your backpack on a hike, boat trip, or camping trip, and you’ll almost be over-prepared. 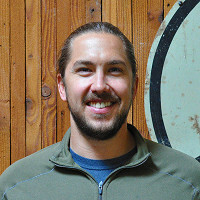 Hi everyone–I’m Brendan Collins from Seattle Sports. We’re honored to partner with The Grommet to launch the FireWaterMulti-Bottle, and very excited to share this product with all of you. I’m here to answer any questions you have, and look forward to getting one in your hands. Thank you! I have a ? ... is it safe to hang it on your backpack when hiking? @mary Thanks for the question, Mary. Yes - It is absolutely safe to hang on your backpack while hiking. Simply un-clip the silicone strap from one end to loop through an attachment point on your pack, and reconnect the strap to allow it to dangle from your pack. What is volume of water it holds? @Sharon With a full charge, the light lasts for ~5 hours on the high setting, ~12 hours on the low setting, & up to 15 hours on the emergency/strobe setting. How long does a charge last and where is the product made? @Melody It takes ~5 hours to charge the battery completely via USB, and ~8 hours to charge completely via solar (highly dependent on light intensity). With a full charge, the light lasts for ~5 hours on the high setting, ~12 hours on the low setting, & up to 15 hours on the emergency/strobe setting. It is manufactured in China. Will this product be ok if left exposed to the elements should you be caught out in a rain storm while it is out side your pack? @D Yes - The solar panel & USB port on the lid is highly water resistant (just not long-term submersion waterproof), and given that the lid is sealed properly, the contents of the bottle will remain dry when it's being used as a waterproof case. Just under a half pound, Joeline. .45 lb to be exact. @Joeline 7.2 oz including everything! @Dave Correct - It is made with food-grade silicone that is BPA-free, PVC-free, & dishwasher safe (except for the lid, which should be cleaned by hand). It seems like the colored ones are more subtle and the white ones would glow brighter....is that true? Trying to figure out which on to buy for my camping son. :-) Thanks! @Guest While I don't know the exact difference in lumen output between the colored & white bottles (sorry! ), I agree that there is a VERY slight difference, though negligible even when side-by-side. They are remarkably similar and all emit enough light to read by, play cards around, be seen from a significant distance (i.e. in emergency settings), etc, and I would urge you to go with the color that is most appealing! @Michael They are not available as solar only, but rest assured that the band is very easy to put in place, which will waterproof the USB port even in heavy rains (there is also a secondary USB port plug underneath the band). The band is also glow-in-the-dark, so it is easy to find in your tent or on your nightstand at night. Additionally, it is textured and provides additional grip when tightening/loosening the lid with wet hands. So, where is it made? It is made in China, Pamela. I saw this product in Atlanta recently and I really liked it. It puts off very nice light and the jar is soft and pliable. It is definitely going with us on our next bike tour! @Brendan... My city bike looks great with the headlight and tail light I got from you, thanks again! Hi. 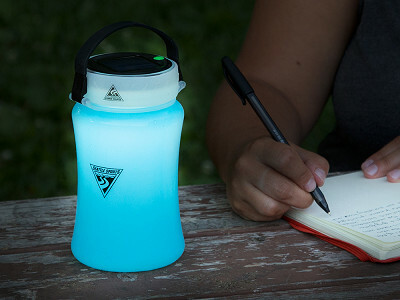 This solar water bottle looks pretty cool, but I wonder how long it holds the charge after it has been fully charged?? @Annette In answer to the same question earlier today, Brendan said, "It takes ~5 hours to charge the battery completely via USB, and ~8 hours to charge completely via solar (highly dependent on light intensity). With a full charge, the light lasts for ~5 hours on the high setting, ~12 hours on the low setting, & up to 15 hours on the emergency/strobe setting. It is manufactured in China." When we first heard about FireWater, we weren’t sure why one would need a combined waterproof container, solar powered light, and water bottle. But, it turns out, it’s an ingenious idea for anyone who’s outdoorsy. Charge up the solar lantern during the day or, if the sun isn’t cooperating, use the USB port. When evening hits, you’ll have 50-100 lumens to light up your tent or trek. Meanwhile, use it as a leak-proof water bottle. The LED light won’t warm up your water, but your water will have a nice colored glow. And as well as FireWater can keep your water in, it can also keep water out. This multipurpose lantern is a waterproof storage container, too. Put your valuables inside when you kayak or if it rains. As long as you keep the included elastic over the USB port, the inside will stay dry.